On shower heads, that is. On pretty much everything else we are polar opposites. But on shower heads we have common ground. 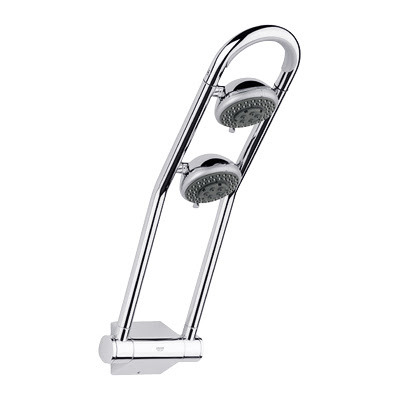 The Grohe Freehander shower was one of the products we chose for the boys' bath renovation last year. It also made the Forbes Luxe-for-Less home improvement list. I have loved this product since I first stepped into the shower after the renovation. We kept the same plumbing in this bath, changing only the valve, trim and shower head, which kept costs down and the Freehander was, much to the plumber's surprise, really easy to install. The actual price on the street (or the internets) is much cheaper than the one quoted on forbes.com. Because you can adjust the arm it really works for my 6' 2" husband (no more twisting and bending to get the shampoo out), and I can pull the arm down to get an arc of water over my head. It looks good, it's powerful and if you set it to "massage" it kneads all the knots out of your achey shoulders. What more can a gal ask of a shower head? The only change I'd make if I had to do the remodel again would be to spring for the Thermostatic Temperature Control Valve, just to ensure the water is at a constant temperature no matter who might decide to clean their teeth while I'm taking an invigorating but warm shower. That would really be luxe!